The Easy Cut can be anything that looks best on you. The fun part is learning how to do it yourself with a Wahl clipper. Using your Wahl clipper, start with a long attachment guard, such as a number 7 or number 8. These combs allow you to cut the lower section of your head without removing too much hair. Cut upward from section 1 through sections 2 and 3. Continue cutting around your head using a rocking motion that helps blend the sections of hair for a smooth and even cut. Once you feel comfortable using a long attachment guard, you are ready to start cutting your hair shorter with a lower-numbered comb. Selecting the appropriate attachment guard for your style, begin cutting the top of your head, cutting from the front. Cut section 4 from the forehead to the crown. If you notice any cut lines between sections, use the attachment guard you used on a lower section to blend the sections. To remove more bulk from behind the ears, use the left ear tapered attachment guard. Start behind the ear and arch the clippers around the ear for a clean line. Repeat these steps on the right side, using the right ear tapered attachment guard. 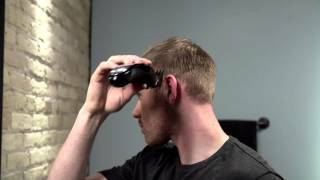 Using your Wahl trimmer, clean up your sideburns and the back of your neck.